So I thought it'd be cool to finally catalog (with pics) all of the bolt-on turbos that have been manufactured for the 7mgte. Here is the Turbonetics Turbo. Thought this thread would have a little more momentum. Rather have mounted pics, but had to scrounge the net for these few. Beggers can't be choosers. Now I must ask, where can you still get these bolt on turbos?? Only 2 places I know of to get a new one. I hope there are others that know of more companies that still make Supra bolt on turbos. Comp Turbo is who makes them for Supra Sport and you can buy direct from Comp. The SP turbo is made by Precision and not sure if they sell direct? The Turbonetics unit not sure if they make them anyone? Pretty sure Grimjack's still running his Stage 3. Comp turbo was formed after a split at Turbonetics. I think they make different A/R CT housings as well. I should order one and throw it in the garage in case no more. 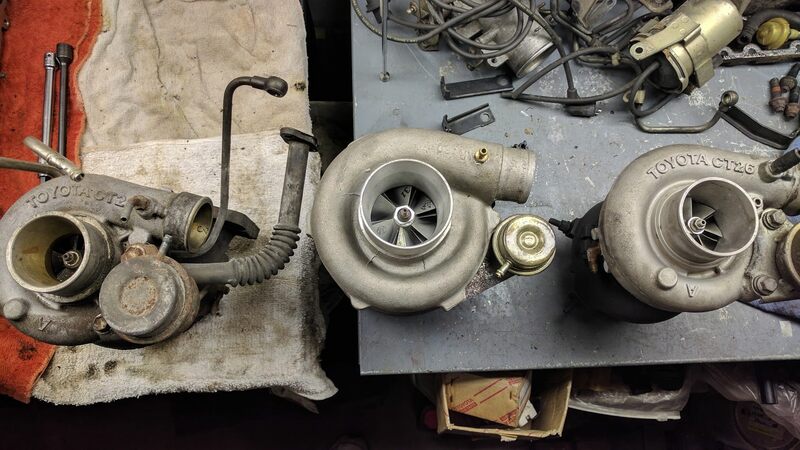 Where does Comp turbo list the CT housing turbos? Or do you have to contact them directly about it? Yes I noticed that also and you need to contact them to get info. Yeah I just called Comp turbo. They said that product for the 87-92 supra was such a low volume item they discontinued it. They don't have any more parts for them on the shelf either. This is for the CT26 style bolt on turbine housing. Even the casting mold was designed by them, they had the parts made at a foundry. That's quite a big investment for something like this. Dang that is sad! I should have grabbed it when they still made them! It was a cool option that looked stock and had a lot of options. Precision maybe still making them?? Not sure if they were better or worst then Comp? Yeah I called Precision as well. They were very reluctant to give any information on this. He mentioned SP offering a product and that they didn't sell any or know of any. When I asked where SP was sourcing the custom made turbine housing he shut down and said even if they made it he wouldn't know anything about it. Maybe someone can find a individual at Precision that is willing to give out some more information. If comp turbo made the investment for the mold, they must still have it. I wonder if they'd sell it if they're not using it? Would be a shame if they threw it out. I saw an identical one that was used selling on ebay around a year ago. Guy was only asking $500 and no one bid. I couldn’t believe it. I was seriously thinking about picking it up, but it’d be a downgrade as far as power output from my current 62-1 turbo. It would be nice to have ball bearings tho. Sounds like SP is the only one you can order threw for the Precision turbo CT-26. It's hurts! I could have order one and I remember the guy on the phone saying bring me $1000 cash and I build it any way you want lol! Another very nice option would be a new cast log manifold with a T4 flange and do an EFR on it. Or a new cast housing for an EFR that bolts on would be sweet as well. Suprasport sold the Jr for $1525 in 2010 when I bought this one. Install kit was another $200, and so was the elbow. I don't know how successful the Jr series was for Suprasport. I know a couple of people on here who have them, but I think the Sr line was more popular. Yeah that or a CT26 to T4 adapter using the stock manifold. Though then you would be limited to only internally gated turbos. Is this the only style T4 cast manifold on the market now? Whoa. I had no idea such a cheap thing existed. That seems... awesome. Combine that with a custom downpipe and you've got a wealth of turbo options. Is that cast manifold any good? Anybody have that? manifold is basically a HKS replica. Yes I believe that is a copy of the HKS and everyone sold these. Makes me wounder if they all bought them from the same supplier in China? I would run internally gated my self and close the WG flag. Now the bad part is you can't run the stock heat shields like you can on the Turbonetics stock looking log unit. Yeah, but heat-shields are pretty minor. You can easily find some rigid bendable heat shielding now and make your own custom ones. Very similar to OE style shielding. For me it was about keeping the OEM look on one of my cars while making 500+whp. I don't know why but the idea of a stockish looking engine bay on a low mile car I have that makes decent power is exciting lol. I have the Turbonetics Turbo which I was planing to redo with all new upgraded parts since the CT turbos are not be made any more? Mambatech does make the larger AR housing and larger CT turbos. So maybe the last guys are them now? Eh I don't know if I would trust Mambatech. Has anyone here taken the gamble and bought one of their turbos? From what I hear the owner is Japanese with the factory he owns in Taiwan. I would buy there .64 AR housing they sell and make a new turbo from that. I am pulling the 7M from my car to upgrade to a 2J and will be selling my ITS based stage 4 GTS 60-1 triple ceramic ball bearing BOSS turbo with all the lines etc. It has just over 60,000 km on it but was rebuilt less than 5000 km ago (new seals). Will make 450 wheel easily at 16 psi. PM me. I've got two, not sure their origin. One is machined out toyota housings 60-1 and a P trim turbine I think (aftermarket center section), the other is an aftermarket exhaust housing and PT6176. Heres pictures of them with a stocker to compare. I'm planning to use the 60-1 on my new 7m build and hope for 500whp, if i cant reach it, i'll swap to the 61. Looked at the Mamba offerings a bit more. Not sure the exhaust housings size they chose to make are a great choice. Looks like most of the stuff they offer has a 7 cm turbing housing. Which seems awfully small for an engine this size. Wouldn't all these turbos severely limit the top end power? Yes, the stock manifold and exhaust housings are small and restrictive. If you're looking for top end power/lots of power a t4 setup is far superior, plus has tons more options. The bolton is for stock appearance, simplicity, and quick response. So the stock CT-26 turbine housing is also 7cm / .49 A/R that Mamba lists for their custom made one? I am trying to figure out why they chose such a small custom made housing that can adapt to Garrett CHRA's. Mamba also has a 8cm .64 AR housing as well. 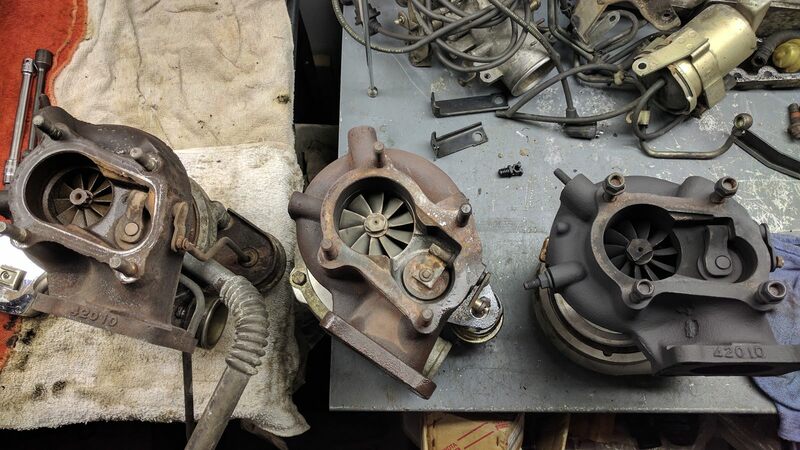 I believe the larger housings are the same that came on the Turbo A cars.